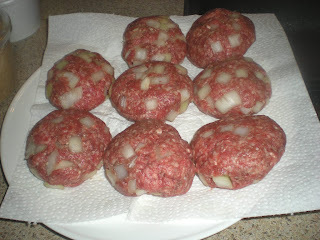 I thought that it would nice if I put a few simple burger recipe on this blog as it was first focused to university students who are looking for inspirations and cooking simple dishes. Here is one of the two burgers that my Taiwanese friend made on Sunday. 1. 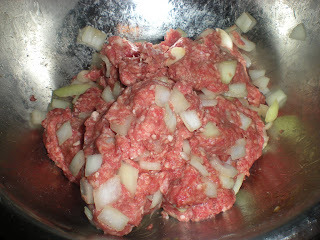 Mix meat and chopped onion in a medium bowl. Season with salt and pepper. 2. Form patty about 4-5 inches in diameter. Chill for an hour. 3. In a large skillet, heat oil over medium-high heat. Cook for 6-7 mins on each side or to your desired doneness. 4. 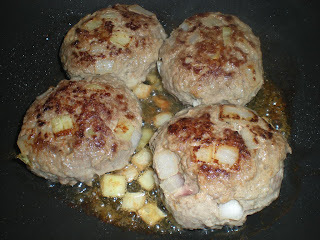 Transfer patty to a plate with paper towel on top to drain fat. 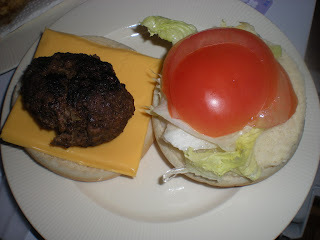 Serve on hamburger buns with cheese, lettuce and tomato.